An action-packed, saucy food comedy featuring one boy’s determination to be top chef! Soma Yukihira’s old man runs a small family restaurant in the less savory end of town. Aiming to one day surpass his father’s culinary prowess, Soma hones his skills day in and day out until one day, out of the blue, his father decides to enroll Soma in a classy culinary school! Can Soma really cut it in a place that prides itself on a 10 percent graduation rate? And can he convince the beautiful, domineering heiress of the school that he belongs there at all?! Fighting to save Alice’s society from being abolished by the Azami administration, Ryo Kurokiba, battling as her champion, begins his shokugeki with Central elite Kusunoki. The theme is salmon, and both chefs put everything they’ve got, including their pride, into their dishes. So what’s got Alice so troubled that she tells off her own uncle, Dean Nakiri, at the end of the match?! Yuto Tsukuda won the 34th Jump Juniketsu Newcomers' Manga Award for his one-shot story Kiba ni Naru. He made his Weekly Shonen Jump debut in 2010 with the series Shonen Shikku. His follow-up series, Food Wars! 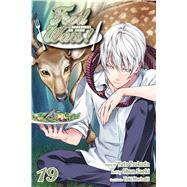 : Shokugeki no Soma, is his first English-language release.